S.T.A.L.K.E.R. developer GSC Gameworld is behind it. 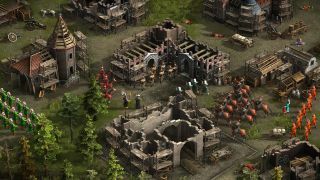 It's titled Cossacks 3, but really this is an HD remake of the original Cossacks, a ginormo real-time strategy game that whacks up to 10,000 soldiers at one time into various battles drawn from 17th and 18th century European history. That's a lot of soldiers, if my maths is correct, and here are some other big numbers for ya: 12 nations, 70 unit types, five single-player campaigns, eight-player multiplayer. There are depressingly few RTSs around these days, so if you still enjoy the genre, particularly the historical variety, you'll be pleased to hear that GSC Gameworld's latest Cossacks now has a release date: September 20. That's not very long away at all, and if you'd like to add it to your wishlist in anticipation of never buying it because cripes, look at all the games you have in your backlog already, Cossacks 3 can be found on Steam here.